Sure! My first recommendation is that you read them. In my case, I actually prefer to listen to them, but the audio book selection at my library isn't very extensive. Here are is a self-help book I've read and really enjoyed along with a brief description. When I read a book, my retention isn't all that great so I usually end up with one main lesson that sticks with me. I'll include that for the book too. I'll just do one book today, but there are several books I enjoy and will tell you about in future posts. 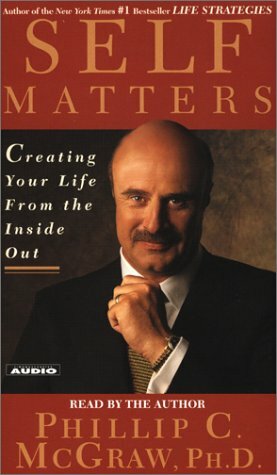 This is the second book by Dr. Phil that I have read and I have to tell you that I like what he has to say. This one focuses on the premise that we create our lives based on other people's expectations of us and along the way we conform and lose our authentic selves. This makes us feel unhappy and lost, so Dr. Phil takes you through the process of seeing what events in your past shaped the person you are today. Then he empowers you with the choice to reinvent yourself by abandoning anything toxic and embracing anything uplifting. He also provides tips on making changes in your life that return you to your own passions and talents. My take home message: It's okay to focus on yourself and go after what you want. The world labels it as selfish, but that's only because it's in the world's best interest for you to conform.True selfishness does exist, but simply living your authentic life isn't it. You can't help anyone else if you haven't taken care of yourself first.